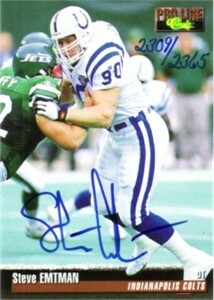 1995 Pro Line certified autograph card of former Indianapolis Colts top draft pick Steve Emtman, whose career was cut short by injuries. #2309 out of 2365 signed. ONLY ONE AVAILABLE FOR SALE.